is her adorable little sister: the "mini" size Zero messenger. 1. One of the precautions I always take while prepping for travel is to seal all my fountain pens, brush pens and ink-filled waterbrushes in zip-lock plastic bags in case of high-altitude leaks. During all of the flights I’ve taken, I’ve never had any leakage problems, even minor ones, with any fountain pens or fountain-pen style brush pens I’ve carried. (On my flight home from San Francisco, I skipped this precaution and suffered no problems at all.) The only item that absolutely requires this precaution is the ink-filled waterbrush – it consistently leaks, sometimes quite badly. The solution is to fill the chamber as fully as possible – the less air available to expand, the less it will leak – wrap each waterbrush tightly with a paper towel, place them into a zip-lock bag, and seal it completely. When I arrive at my destination, I just toss the inky paper towel and rinse off the brush handles. including minimal sketch gear. It's about 8" wide by 9" tall. 2. While in transit, whether by plane or train, I keep bare essentials in an easily accessible but secure passport case with a cut-proof strap. Remaining on my person throughout the ride, it holds my passport, cash and credit cards, glasses, smart phone, writing pen and ear plugs (for the inevitable crying baby in the adjacent row). Over time, my definition of “bare essentials” has expanded to include those items I would take to Gilligan’s Island: a fountain pen containing water-soluble ink, a waterbrush and a pocket-size catch-all sketchbook or my preferred Rhodia journal (for longer trips). Accessible without having to rummage through my backpack under the seat, those few sketching supplies have kept me entertained through many flights. 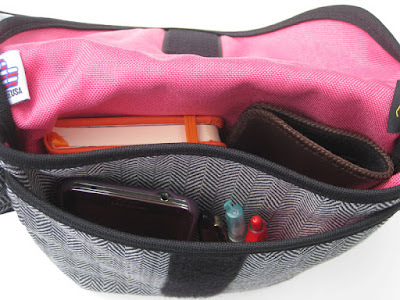 This case is used during transit only; once I reach my destination, its contents go back into my daily-carry Rickshaw Bagworks Zero messenger bag. Recently, however, I’ve found my old passport case to be a little too tightly stuffed for all of those items, so I tried something slightly larger on my recent trip to the Bay Area. 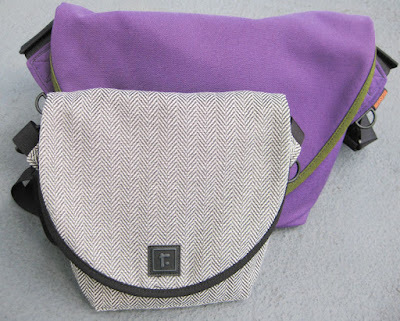 It’s the “mini” size Rickshaw Bagworks Zero messenger bag – an adorable baby sister to my trusty “small” size Zero. I bought the mini last year when I was considering it for the “quiver” concept that ultimately failed, but this is a better use for it. It’s an ideal size for my bare essentials (even the slightly bulky Rhodia journal fits comfortably), the construction is soft and lightweight, and the “performance tweed” fabric I chose looks classy enough that it could go out for the evening (and still accommodate a little drinking-and-drawing). For greater security, I might try replacing the strap with the cut-proof strap that came on my passport case. Looks like a great bag for traveling!